ICH Blog: "Buy a broom in May, and you will sweep your family away." 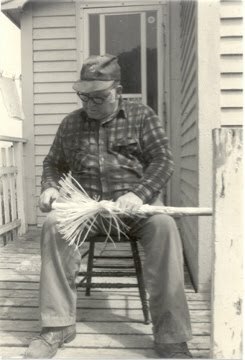 "Buy a broom in May, and you will sweep your family away." I got a phonecall yesterday from a friend who happened to be at a shop on Stavanger Drive. She was pondering buying a broom, but knew that there was one month when she wasn’t supposed to. A friend with her was trying to talk her out of buying it. I told her that it was, indeed, May month that was said to be bad luck for buying a broom. Off she went, broomless, with plans to go back June 1st. All in a day’s work for your friendly provincial folklorist. The old gentleman‥strictly forbade green brooms being used in his house during the month of May, and, as a reason for the prohibition, used to quote the adage—‘If you sweep the house with broom in May, You'll sweep the head of that house away’. Are you familiar with this tradition in Newfoundland? If so, which communities had that folk belief? Leave a comment! I'm interviewing my mom for a folklore project and searched superstitions and then beliefs on your site. I'd never heard "buy a broom in May, sweep your family away" but it was one she mentioned. Her fathers family is from Lower Island Cove but her mom is from Quebec. Thought it was funny to come across it.